USP 797 provides practice and quality standards for all persons who make Compounded Sterile Preparations (CSP) drugs and nutrients and for all environments in which they are prepared. It describes conditions and practices to prevent harm, including death, to patients that could result from microbial, chemical and physical contamination, endotoxins and variability in the intended strength of ingredients. USP 797 requires that the preparation of CSPs occur in ISO Class 5 (Class 100) environments, buffer areas of ISO Class 7 (Class 10,000), and ante-areas of ISO Class 8 (Class 100,000). Achieving and maintaining USP 797 compliance in sterile compounding cleanroom environments requires the practice of special cleaning procedures and protocols. Available in both Sterile and Non-Sterile form, Texwipe's Isopropyl Alcohol Solution is 0.2 micron filtered and filled into cleaned, double-bagged containers. Each bottle is lot coded with an expiration date for easy record keeping. Customers using the trigger spray bottle can choose a stream delivery for precise application or coarse spray for larger area application. This is a fully assembled, ready-to-use applicator/container; no unpacking, handling or attaching a separate sprayhead is required. Sterile 70% Isopropanol contains 70% by volume USP-grade Isopropanol (isopropyl alcohol) and 30% USP-purified water. 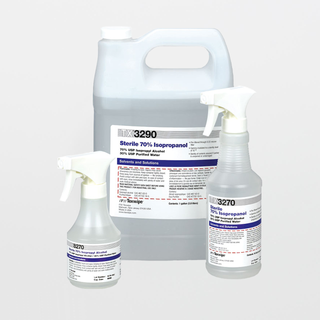 Texwipe offers EPA-registered disinfectants, effective against a broad array of pathogens including MRSA and TB. These products can be used in a wide range of applications other than your standard wall and floor application. TexQ™ Disinfectant is an EPA-registered (10324-85) quaternary ammonium compound (quat) which serves as an effective one-step cleaner/disinfectant..
EPA-registered quaternary ammonium compound (quat) serves as a one-step cleaner & disinfectant. Fragrance and dye free formula. Texwipe Sterile Wipers clean aseptic cleanrooms quickly and easily without compromising the sterile nature of those environments. Texwipe sterile wipers are ideal for cleaning pharmaceutical aseptic fill areas, biotechnology manufacturing facilities, microbiological labs and sterile suites. Gamma irradiated to a 10-6 sterility assurance level. Each sterile wiper shipment is accompanied by lot specific Certificates of Processing and Compliance. Expiration dates are marked on each bag. Available in several substrates, both dry and pre-wetted. Small-lot packaging in solvent-safe bags provides superior sterility and usage control. Texwipe sterile wipers are ideal for cleaning pharmaceutical aseptic fill areas, biotechnology manufacturing facilities, microbiological labs and sterile suites. Texwipe sterile pre-wetted wipers are ideal for cleaning pharmaceutical aseptic fill areas, biotechnology manufacturing facilities, microbiological labs and sterile suites. Available in several substrates. Texwipe removes the guesswork from your daily USP 797 maintenance activities. The AlphaMop is ideal for applications requiring low particle, extractable and ionic contamination. It is superior for wall, floor and ceiling cleaning and is designed specifically for ultraclean manufacturing environments. The mophead material is made of laundered 100% knitted-polyester with a fiberglass handle. The mop is packaged in bag-within-a-bag® cleanroom packaging. Building on the popular AlphaMop™, the autoclavable TX7108A provides the ideal flat surface mop for cleaning and disinfecting aseptic areas. Tested to withstand the rigorous demands of the steam sterilization process, the Autoclavable AlphaMop ensures consistent performance for ultraclean production environments. Large polyester mop system for the easiest and most efficient wiping of floors, walls and ceilings. The Mini AlphaMop™ Isolator Cleaning Tool is designed to clean isolators, biosafety cabinets, glove boxes and laminar flow hoods. The mop has a low, flat profile and rounded corners. It is made from Celcon® plastic and is totally autoclavable. The swivel joint allows a user to reach difficult-to-access areas. The replaceable foam pad ensures that the mop cover conforms to the surfaces being cleaned. Polyester mop system is ideal for use in small, hard-to-reach areas. We've enhanced the Texwipe adhesive contamination control mat line with exceptional choices and superior performance. Whether cleaning protocols require portability or the surface just isn’t conducive to adhesives, CleanStep’s mix of sizes and colors are sure to fit the bill. Offering 36 mat/frame combinations, the easy selection will improve your environment and save you time. Adhesive mats available in 30 and 60 layer and in Blue, Gray, and White. Gloves are sterilized by gamma irradiation to meet AAMI and ASTM standards. They are approved for use in both USP797 and chemotherapy applications. Each case is marked with batch numbers to meet internal QC requirements and full product traceability. Sterile gloves available in bulk and pair packed.